If you haven't heard of Sassy Bloom and their gift box subscription service, then you really need to head over to their website and check out what they are offering. As a new mum, I hadn't heard of Sassy Bloom until I started reading parenting blogs and parenting hashtags on twitter. In fact, I think the DADventurer was one of the first people I saw blogging about his Sassy Bloom box. I was pretty miffed that I hadn't heard of them (or that I hadn't received one!) and so I decided to give it a go. It is a subscription service that delivers a box to your door, each month, which is filled with at least £40 rrp's worth of baby products. The products are tailored to the age and gender of your baby. 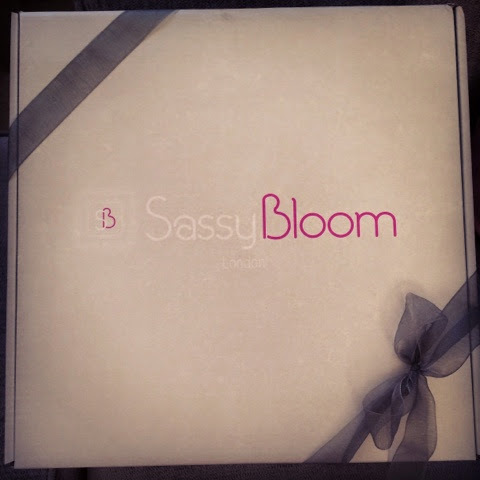 You can find out more, and see videos and photos of the boxes at the Sassy Bloom website. Unlike the majority of reviews for Sassy Bloom, my box was NOT given to me as a freebie. Even though I now write guest blog articles for the Sassy Bloom Blog (which you can find here), I have paid to have a 3 month subscription. Therefore I have shelled out my own precious pennies to have 3 of these boxes, and I will review each one. Packaging: The box was securely packaged for delivery and came stylishly wrapped with a silver ribbon. It looked beautiful and of high quality. The Sassy Bloom design is also appealing and attractive. Infacare Ultra Mild Baby Bath – RRP £2.35: We have used this and it seemed very gentle and soft on Jake's skin and (even though he can suffer with infantile eczema it hasn't seemed to aaggravate this). JoJo Maman Bebe Bunny Blue White Stripe – RRP £3.50: Really cute and very sweet little cuddly toy which I expect Jake will learn to like. At the moment he isn't really able to appreciate it. Munchkin Hot Safety Duck – RRP £3.00: Very useful product, we have a Phillips Avent thermometer which does the same job, but the novelty duck is cute and friendly. Will be fun as Jake grows too. Aquaint 100% Natural Sanitising Water – RRP £2.49 AND Vital Baby Aquaint 100% Natural Sanitising Water – RRP £2.49: These are useful to have (I haven't had chance to try them properly - but I was a little disappointed to have two products that were so similar. Oball 4″ Ball – Blue, Green – RRP £4.49: This is a nifty little toy for a baby Jake's age, as it is easy to grab and light enough to hold easily. However, it feels a little 'cheap'. Personalised Towel – Cream – RRP £14.99: This is by far the best, and my favourite product in the box. It has a cute rocking horse sewn on, with Jake's name embroidered in blue. Lovely, soft towel which is very nice quality. We have already enjoyed it. 'Hello Fresh' £25 voucher card: I am not entirely sure if this card is £25 credit, or how that 'value' works yet, but the service is not something my hubby and I would really use. It *may* become a Christmas gift for someone else who I know would love it. However, if you were a new mum, or a mum close to due date this service would be good as you could get meals and ingredients prepared. Good that you can save £10 by using my referral code SASSBEXM, and then earn credits yourself too by reviewing on your account. Let me know if you decide to give them a go!